Alas, Stephen Hawking, if you think boycotting Israel helps Palestinians, think again. Let’s hear from other academic voices. Raphael Cohen-Almagor explains the fallacy of a boycott campaign which no longer pretends to target only institutions, and now openly and predictably excludes Israeli individuals. Most Jews consider the boycott of Israel a threat to Jews, if not an active attack on Jews. Consequently boycotts exert strong introverting pressure on Jews. As an anti-Jewish strategy (which boycotting Israel often is) antisemites should understand why they fail to annihilate the object of their hatred. Norman Geras points out that antisemitism is interrelated with Jewish survival – it strengthens identity and mutual bonds between those who are designated and threatened as part of an ethnic group. Norm isn’t the first to note this paradox – unread as yet on my bookshelf is Dan Cohn-Sherbok’s book The Paradox of Anti-Semitism which contains many examples of Jewish leaders recognising this dilemma, from Rabbi Shneur Zalman and the spiritual dangers of integration to Theodore Herzl (“It is only pressure that forces us back to the parent stem”). In contrast, Moses Mendelssohn, Jewish Enlightenment leader, set out to secure both the Jewishness and the participation. Robert Fine looks at the beginning of Jewish emancipation when the establishment extended a hand, if mistrustfully and conditionally, to German Jews. Ruth Wisse observes that throughout history where Jews suffered a deficit it tended to strengthen their collective resource and tenacity. Since emancipation, freed of the deficit and with a state of their own, but retaining a strong shared memory of persecution and a disinclination to take their continued success for granted, Jews are seen to strive and excel when taken as a group. Consequently in today’s prevailing (and I think ill-conceived) meritocracies, Jews have successful positions in greater proportions than their overall numbers indicate. Consequently it is easy for people affected by antisemitism to forget the obvious: Jews are individuals, not a coordinated group. So are Jews out of the woods? It depends on the resilience of this society. At the heart of the boycott, political historian Jonathan Lowenstein explains, is envy, and this envy is sharpened by a shrunken economy. And after the Enlightenment came a global competition for resources and a related decision by a great power to do away with all Jews and appropriate their prosperity. So while I think speciesist, tribalist views of Jews about Jews belongs to desperate times, on the other hand to quote Hannah Arendt when attacked as a Jew it’s opportune to respond as a Jew. Perhaps the desperate times have arrived. Eve Garrard sets out the pleasures of antisemitism, (if you read nothing else, read that) which brought to mind Iain Banks’ lost tussle with antisemitism as his life reaches its premature end. In my trade union anti-Jewish activity I expected to be against the law has been found to be inside the law. David Hirsh and Sarah Annes Brown respond to the judgment from the legal action taken by Ronnie Fraser against the University and College Union on grounds of antisemitism related to anti-Israel campaigning. More on this from me in due course. Stephen Hawking talked of pressure to boycott in ways which remind me of my MP’s appeal to populism in explaining that he is against gay marriage or protecting abortion rights because most of his correspondents have urged him to be. Perhaps Hawking represents a second phase, a mainstreaming of boycott. On the other hand, he has embraced the British Committee on Universities of Palestine, an organisation staffed by UK Israel eliminationists who, far from supporting a Palestinian call, instigated boycott themselves before any Palestinians had made call (takes your breath away, doesn’t it). There are so many reasons not to boycott. Now, go and see if you can form some links with Israeli academics or cultural institutions, which despite all this acrimony are incredibly fertile, humane, questioning places. UCU’s boycott of Israel blinds it to antisemitism. Is this solidarity? In a post on Engage, David Hirsh gives context to the invitation UCU, the main British trade union for academics, extended to Bongani Masuku to speak against Israel. Last week, Bongani Masuku was found to have incited hatred against Jews by the South African Human Rights Commission. Self-righteously, UCU rubbishes the SAHRC and the blogs which have tried to raise the alarm about Masuku. What is the word for an organisation so self-regarding that it considers the actions or decisions of its activists sufficient benchmark of goodness, regardless of any other objective criteria? UCU is like that. It would be ridiculous if it wasn’t so serious. “The Human Rights Commission is a national institution of post apartheid South Africa. Part of the antidote to the old racist system, and independent of government, this institution functions as the linchpin of the new constitution which endows the rainbow nation with a set of legal and democratic guarantees. The Human Rights Commission ruled last week that the statements of Bongani Masuku on the subject of Israel amounted to antisemitic hate speech. He is a senior official in the South African trade union movement and is currently in the UK on a trip paid for by the University and College Union to promote the exclusion of Israelis, and only Israelis, from the global academic community. He then summarises the history of the anti-boycott campaign in UCU, which warned against precisely this welcoming of antisemitism. To quote a comment which once caught my eye on Engage, UCU’s insistence that its anti-Zionism cannot be antisemitism is “A bit like the commercial for a car where the would-be buyer asks “Do you have any colour but black?” and the salesman replies “Yes, we have noir””. What kind of trade union would allow law to become the only thing standing between a group of people and the enactment of another trade union’s prejudice against them? Is this what solidarity has come to mean? David Hirsh has live-blogged discussion and voting on the international business of UCU Congress 2009. Aung San Suu Kyi? You must be joking. Israel and the Socialist Worker Party’s cherished boycott. There were 4 late motions, which breezed through undiscussed and unopposed in a derisory 10 minutes. The Israel business took well over an hour. Consider for a moment everything that is going on in the world, and then think about how shocking and dysfunctional that is. “If this motion if passed is void – what is the point of continuing? do we debate it or not? we need some guidance. it is avalid point of order to know what we’re doing with it and what will happen to it. Then it gets difficult to tell what happened, because the records and agenda don’t show which amendment got voted for (there were several). I guess they decided to test the law. But what does this mean? The union leadership won’t allow them to test the law – what they’ll end up doing is boycotting as individuals, in which case the union won’t be liable. I can’t really claim to understand. And the reason I don’t understand is that this isn’t pro-Palestinian activism, it’s a bunch of people masturbating each other. I think boycotters in my union are in the grip of a collective delusion. They seem to be in a bubble where they confirm and reassure each other. This is what the SWP is famous for, hollowing out the organisations they colonise. They’re well on the way with UCU. Engagement is terrible unless there’s a pay and conditions crisis on. I reproduce some of the most illustrative parts of David Hirsh’s write-up, and be aware that the quotes are from his transcript, which he notes is rough. “I would like to take this proposal to the membership of the union. we have been refused the ability to have a ballot. This is because the membership of this union strongly oppose an academic boycott of israel. all the votes in branches have indicated 80 or 90 percent of members oppose this call. “We cannot rely on votes. Lets not make this a bureaucratic procedure. What we have seen is a fundamental abuse of human rights. “We make no apology in relation to the legal opinion. it is only opinion. has not yet been tested. it is about time that this union tested this opinion in court. we have been as a union extraordinarily careful. “we have an obligation to go further in relation to BDS. that is what Motion 29 called for originally. “…if we lose an argument here then it is back to here that we should bring the argument because if we don’t do that then we rubbish this union and we rubbish democracy. we should not walk away, whether threatened by the law or by anything else. “it wasn’t just black workers struggle. Camilla Bassi, Sheffield Hallam (she’s not a self-aggrandiser, I excerpt her for purposes of comparison) had just noted that the end of apartheid was brought about by black worker militancy. “I beg you read the report produced by Amnesty about Hamas. Discover what Hamas did to supporters of Fatah. hamas went round and machined gunned in their hospital bed supporters of Fatah. That point needs to be made. “British government is complicit with repression against Gaza. “Constructive engagement would be the worst thing. The only constructive engagement we can have with the Israeli authorities is one backed up by the idea that they face isolation. “Indiscriminate bombing of civilian population in Gaza. unlawful us e of white phosphorous. 1400 civilians killed, many of whom children. That was Motion 25 – Disabled people and conflict – but turned out it was only about disabled Palestinians. I’m for constructive engagement. Neither Palestinians nor Israelis will be ostracised out of existence, and what we are doing surely strengthens the most virulent elements. I’m for academic freedom – I’m certainly against academic boycotting – it doesn’t even work, it’s just a gesture. And I’m for Jews. “Dr Barham wants us to rank rights, so that “loftier” ones, such as academic freedom, are sacrificed for basic ones. This is deeply problematic. It completely undermines the idea of academic freedom, making it conditional on a wider political project. We are asked to suspend the academic freedom of Israeli colleagues because of our opposition to the actions of their government, but this is not a test applied anywhere else in the world. The proposal to boycott Israel exhibits an unwarranted exceptionalism. And that is why the proposal is discriminatory. It discriminates against a group of people; applies hard treatment to them. It does so in the absence of a morally relevant property that the group – and no other group – possesses. This makes it unjust. The group harmed consists almost entirely – and not by coincidence – of Jews. Whatever the intentions of the boycotters, this discrimination against Jews is undoubtedly one effect of the exceptionalism of their proposal. The proposal is discriminatory, and the union has been told as much by its lawyers. It also takes us beyond the bounds of our proper purposes, which will come as no surprise to lecturers fighting to hang on to their jobs and keep their courses open, frustrated by our obsessive annual slanging match over Israel and Palestine. We mustn’t mistake a campaign of exclusion for a campaign of solidarity. Via Engage, UCU Unity are getting my vote. Please find below a list of recommendations for the current round of UCU elections. The list is a recommendation, designed to maximise the number of seats these candidates can win: if you have your own preferences please follow them but continue preferences for these candidates. The candidates listed below all strongly support the position that the priorities for UCU must be to put workplace and industrial issues to the forefront of the agenda. Unlike others in the election, all of the candidates below were free to write their own manifestoes and set out their priorities directly to you, the members. All are free to vote on their own platform and will vote in the NEC according to the arguments made on issues, not according to policy decisions determined in external bodies to stifle debate in the NEC. While voting may seem a laborious process, we would strongly encourage you to vote this year, as the NEC more than any other body sets the direction which the Union takes. Please exercise the preferences to cover all those in the list: the first two years have proven that transfers and fractions of votes are vital in the election. In addition, please resist the urge to only vote in sector-specific elections. Also please forward this list to as many colleagues and UCU members as possible encouraging them to vote through unofficial e-mail lists, research lists etc (NB: UNLESS IT HAS BEEN SANCTIONED THROUGH COMMITTEES OR GENERAL MEETINGS, PLEASE DO NOT USE BRANCH MEMBER LISTS AS CANDIDATES HAVE BEEN WARNED ABOUT THIS). Voting does make a difference in this election as there are vast differences between candidates as to what the union’s priorities and directions should be. Shimon Peres, a stately and upright 85 year old, was elected President of Israel by the Knesset in 2007. I have an earlier biography of his ‘Fighting for Peace’ – he’s seen it all. He got out of Poland in ’34, fought hard to establish Israel, and has been fighting to keep it there ever since. He won a Nobel Peace Prize in ’94 for his work on the Oslo accords, the closest to peace that Israelis and Palestinians have come. Peres was Oslo. These days he is seen as a realist dove. He is not in favour of attacking Iran – he calls for an international alliance to turn Iran from an atomic bomb. The Peres Centre for Peace is responsible for, among other initiatives, making the case for reducing the number of checkpoints in the West Bank and working out the equitable distribution of water. As well as the chanting you can hear in the video from the tens of students protesting outside, he was heckled every five minutes by 8 kitsch pro-Palestinian activists touting the usual slanders – ethnic cleansing, apartheid, mingled with protest about the settlements. I guess maybe they thought that Peres might have forgotten about the Palestinians for a minute. I always wonder why the facts don’t speak for themselves – why do they need exaggeration, discrimination into ethnic cleansing, occupation into apartheid. I’m cheered that Balliol let students into the event on a first-come-first-served basis, even though the event was evocative of Maoist youth shouting down the dalai lama. Here we have a pro-Palestine movement of mostly led by, from what I can gather, white Stalinists, that shouts about debate and free speech as a way to make hair-raisingly discriminatory points and policies against Israel, but when there are moves to give an Israeli a chance to make his case you realise that free speech and debate are simply convenient pretexts. Double standards and contorted values characterise this movement. Peres talked about the origins of Zionism in antisemitism and it occurred to me that the dominant kind of anti-Zionism fits the bill of globalised antisemitism pretty well these days. The weirdly intense and aggressive kind which of confuses Zionist with Jew, perpetuates war, subordinates all principle to the single cause, and has given more principled anti-Zionists, particularly Jewish ones, reason to recoil. The boycott campaign against Peres – supported by the Palestinian Campaign for the Academic and Cultural Boycott of Israel is the most recent bit of evidence that the boycott is a continuation of the campaign against a peace settlement with nationally-minded Jews in the region, which came into focus with the Arab Revolt of 1936-9. It isn’t possible to boycott the leading Israeli peacemaker and at the same time make a credible claim to want peace in the region. The boycott campaign is a rallying cry for Palestinian militancy. The peace in question is a simple victory – a forcible end to the Jewish state. So, Ali Bahrer Chair of the Hebrew University’s Arab Students Committee, has the right to refuse to shake Peres’s hand. Certainly the opportunity to vent your disapproval at a leader on a walkabout doesn’t come up every day. That he did this while screeching “child murderer” was hateful as well as politically facile, and to treat Peres as if he had set out to kill 108 Lebanese civilians who sought refuge from the war between Hesbollah and Israel in a UN shelter at Qana was nasty. But for his idiotic outspokeness Bahrer didn’t deserve (and Peres had no part in it) harassment, the removal of his student card or the termination of his accommodation. This is no way to treat a member of the most excluded social group in Israel who has merely spoken his bile, however idiotic. The Hebrew University has since reinstated them. “Muslims, Christians, and Jews peacefully coexisted in various places for centuries, but the establishment of a political movement called International Zionism, which has no connection to Judaism, created a regional crisis and a chasm between Muslims and most practicing Jews. Maybe the majority of pro-Palestinian activists in this country aren’t terrible but pro-Palestinian activism is famous for being terrible: irrelevant; futile; distorted; bitter; hostile to Jews; anathema to peace – no help whatsoever. As at least one of my readers may recall, I had a long conversation last night in the pub near where I work with somebody I like, a very clever and compassionate anti-Zionist who doesn’t understand the problem with comparing Zionists to Nazis. I could hear my voice rising until, as my Matt would put it, only dogs could hear. Luckily my interlocutor was patient. He was trying very hard to understand, but he didn’t understand. It’s some consolation that more knowledgeable and articulate people than me also face this problem. Imagine having these conversations every day because it’s your academic area and because there’s an intensification of activity and you understand the threat. David Hirsh, an immensely patient and forbearing person, does. “It is false to say that Israel is trying to achieve a ‘final solution’ by killing the Palestinians. We should not educate students in London to believe what is false. It is true that conditions in Gaza are extremely difficult. The borders are tightly controlled by Israel and by Egypt. The de facto government in Gaza, elected in January 2006, which later took total power in a coup against the Palestinian President, promises war against the Jews of Israel to the end. The Israelis pursue the Hamas fighters into the streets and housing estates of Gaza, resulting in the inevitable and routine deaths of civilians. In Gaza there is agonizing poverty and shortages, for example of medical supplies. There is little freedom of movement for Gazans. But talk about Gaza being a prelude to a ‘final solution’ is just false. But it is more than false. It is vile. Why can’t you see that the designation of ‘Zionists’ as Nazis is vile? Why don’t you feel it in your political bones? Why doesn’t it set your internal racism alarms ringing? I think the reason is that too many radical people no longer understand irrational and disproportionate hostility to ‘Zionists’ to be a form of racism. They have internalized a commonsense notion that demonization of ‘Zionists’, in Jennifer Jones’ sense, while perhaps not entirely right, is neither entirely wrong. ‘Zionists’ are thought of as being at the centre of bad things that happen in the world. ‘Zionists’ oppress the Palestinians and the Palestinians stand for the oppressed everywhere. ‘Zionists’ are in favour of war and they are responsible for sending America to war in Iraq and perhaps in Iran. ‘Zionists’ have lots of power – in the media, in Hollywood, on Wall Street. ‘Zionists’ failed to learn the lesson of the Holocaust as we learnt it so well in Europe. ‘Zionists’ failed to learn the lessons of imperialism as we learnt it so well in Europe. ‘Zionists’ are behind Islamophobia, which eats at the heart of the new Europe. Background to the event in the Jerusalem Post. Petra Marquardt-Bigman comments. “Suzanne Weiss is a member of ‘Not In Our Name: Jewish Voices Against Zionism’ and has flown all the way from Canada to speak to us at Goldsmiths. But she wasn’t in the Warsaw Ghetto. I’m not sure who is responsible for this Holocaust survivor impersonation, Weiss herself or the twinning organisers, but she certainly capitalised on this status to pronounce that Gaza is like the Ghetto and Zionists are like Nazis, and then to shout for boycotting Israel out of existence. What depths. Personally I hope that the few vocal Zionists (see Hirsh’s definition on the end of the above link) on campus are joined by the hitherto silent ones who comprise the majority of the student and staff body and develop a better practice of pro-Palestinian activism. David T and Harry’s Place commentariat developed the episode into an allegory with an entire cast of characters. As Mark G from the Community Security Trust observes in the comments, the humour has a brittle quality. How could this woman have been invited onto that campus? Where I work, you are confronted with demands that you boycott Israel very frequently. 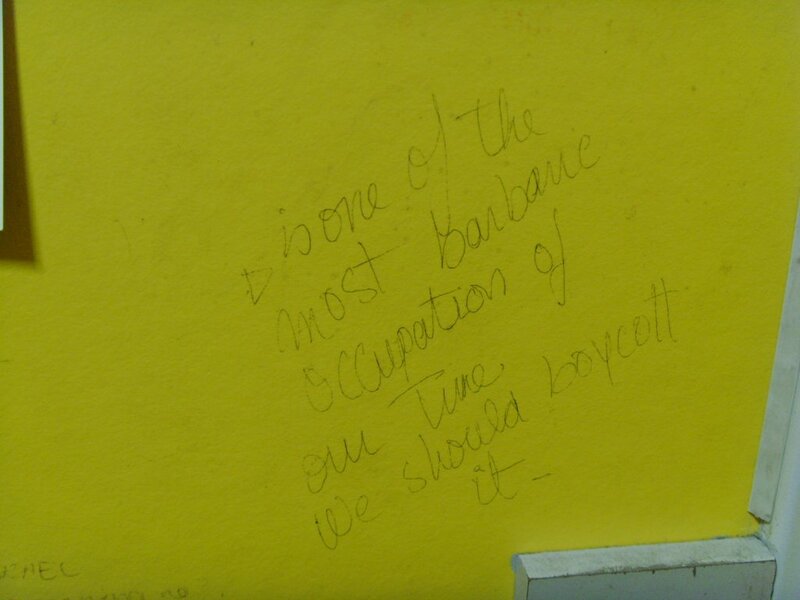 This is the most recent contribution to an ongoing attempt to vilify Israel, on a toilet door. By what measure is Israel “the most barbaric occupation of our time”? Is Israel conducting an occupation? Yes. Why? It’s complicated. Partly because it tells itself it is doing a bad thing to avoid a worse thing. Partly because it estimates it has less to lose by occupying Palestinians and blighting their freedom than it has by not doing so with the threat from Hamas, Hesbollah, Islamic Jihad, Al Asqa Martyrs, and Hizb ut Tahrir whose stated aim is to obliterate Israel and – this is important – eradicate Jews from the region. Partly because its ridiculously pure proportional representation system enslaves it to its expansionists (and who else but Israel is responsible for its own political system?) Partly because it lacks the creativity to find a way out of the cul-de-sac of laying responsibility for ending the violence on the parties who are wedded to violence. Partly because some politically influential Palestinians are so quick to use or threaten violence as a way of grabbing and keeping political power. Partly because, in Abbas, Israel has failed to recognise and work with the most moderate Palestinian political leadership to date. Is the occupation barbaric? No, although it is often violent and it is intrinsically racist. The most famous claims to barbarism – the massacre at Jenin and the death of Mohammed al Dura – were fabricated (they were blood libels). Barbarism to me looks like this lynching. Israel doesn’t do anything like this (and I don’t think Palestinians are either systematically or intrinsically barbaric either). A pro-boycott attitude is an excellent predictor of profound ignorance about the Israel-Palestine conflict, and I feel very confident that there is more to this conflict than any boycotter understands. From what I can gather, the Israel boycott isn’t spreading. Because most people can’t see how it will help Palestinians, only people who think Israel it detestable are joining it. In order for boycotting to grow, boycotters have to make as many people as possible hate Israel. And that’s how they work. Compare with Burma, a regime which relies on forced labour, denies its people any democratic power whatsoever, fails to protect them after an earthquake, and suppresses all political dissent with terrifying violence. A targetted campaign to get Cotton Traders to stop sourcing clothes from Burma works in days. The reason for this is that, if we want to get into league tables, it’s hard to think of a state that treats its people with more contempt than Burma. Unlike Israel, there’s a good case for boycotting Burma: the reinstatement of democracy is entirely in the power of the regime. You don’t have to hate anybody to boycott Burma – you just have to be satisfied that the boycott will work to lever political power.